1. Kayode, Akpan and Kachalla are in partnership. 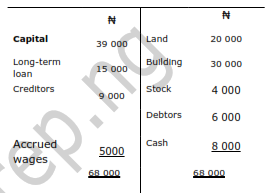 Their respective capital accounts had the following balances: ₦40 000, ₦50 000 and ₦70 000. The partners agree to admit Wamo as a new partner with a one-fifth interest in the partnership capital in exchange for ₦50 000 cash . Wamo’s equity in the resulting partnership is __. 2. Under which of the following conditions is a partnership dissolved? 3. Adama's bank account showed an overdraft of ₦600 on 31st March. Ongoing through the account, it was discovered that the ₦1 080 paid into the account on 29th March has not been credited. What should be the balance is Adama’s cash accounts? 4. Why are adjustments in the profit and loss account necessary? D. To ascertain the actual expenses incurred and income earned during the year. Use the information below to answer question 5 and 6. 5. What is the working capital? 6. The acid test ratio in the company is __. Use the information below to answer question 7 and 8. 7. 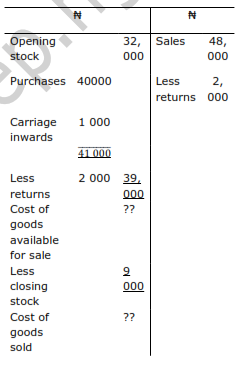 What is the new balance sheet total as at 31/1/95? 8. What is the balance on its cash account as at 31/1/95? 9. Calls in advance are treated in the balance sheet as __. 10. Shares issued to a vendor in payment of business purchased would require a debit to __. Rakiya and Joy are in partnership and agreed that 5% interest per annum is to be charged on drawings. The drawing made by both partners in one year were: Rakiya, ₦200 on March 31st and ₦300 on September 30th. Joy, ₦100 on April 1st and ₦240 on July 1st . 11. The interest Joy’s drawing is__. 12. Assuming that Rakiya was not credited with any income during the period. what is her closing current account balance? 13. To account for expenses paid by head office on behalf of the branch, the branch should__. 14. The officer responsible for ascertaining whether all public expenditure and appropriation are in line with approved guidelines is the __. Use the information below to answer questions 15 and 16. Adex Ltd. issues stock to its retail branches at cost price. The following particulars relate to Ede branch. 15. What is the gross profit carried to the profit and loss account? 16. Calculate the cost of goods credited to the head office trading account. 17. Advertising expenses incurred on a product in a business organization should be charged to __. 18. Four broad classifications of overheads are __. 19. Transfers from the head office to branches are best carried out at __. 20. On dissolution, the final distribution of cash to partners is based on __. 21. In reconciling the branch and head office accounts, remittance in transit in the branch books is treated as a __. 22. 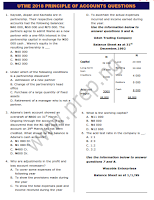 Profit or loss in a partnership is usually arrived at after deducting from gross profit all expenses including __. 23. Departmentalization of accounts is useful because it shows the __. 24. When goodwill is not retained in the business. the entries in the new partners' books will be to debit __. D. partners' capital account and credit goodwill account. 25. Calculate the balance in the bank statement. 26. 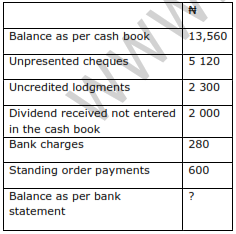 What is the adjusted cash book balance? Use the information below to answer question 27 and 28. 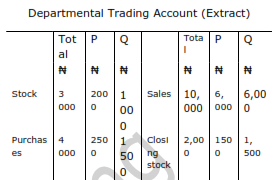 Goods worth ₦300 was transferred from department Q to P. Similarly. P's total expenses for the period was ₦200. 27. What was department Q's gross profit? 28. Department P's net profit was __. 29. 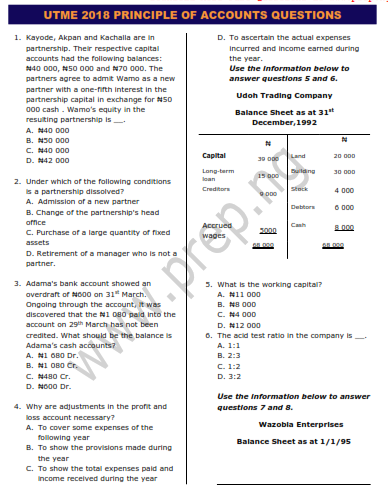 Which of the following is a common cause of a discrepancy between head office and branch trial balance? 30. Sule and Ahmed are in partnership sharing profits and losses equally. If Khadija is admitted as a new partner to take 1/5 as her share. What is the new profit or loss sharing? 31. The prime cost is the total of the __. 32. In the not-for-profit-making organization, the excess of income over expenditure is__. Use the information below to answer question 33 and 34. 33. Find the average stock for the period. 34. Calculate the cost of goods sold. 35. In the head office ledger, the value of goods sent to the branch are__. 36. Which of the following methods of invoicing goods to branches facilitate easy checks on the activities of branches? 37. The amount paid by the new partner on admission as a compensation for the reputation built up by old pant is a __. 38. A partnership's internal regulations are set out by __. 39. In the absence of a partnership deed, the act stipulates that __. C. interest on partners loan should be 25%. 40. The profit of a branch is usually credited to the __. D. head office current account.